Each page of these books would typically have three drawings, along with information related to the prototype on which the drawing was based. There is some duplication between books, such as with Indiana Railroad freight motors that also appear in the Trolley Freight book. At this writing, it is not known what was going to be in Book 11, although it may be a booklet titled “Trolley Model Manual”. This booklet has a similar cover to the other books, but measures 4 1/2” x 12”. This booklet has information about trolley layouts, overhead wire construction, trolley terminology and such. A compiled list of his drawings is here. 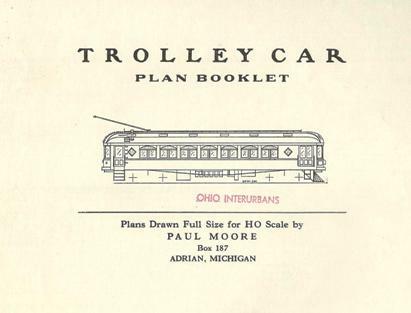 The East Penn Trolley Club has graciously posted a page of scale reproductions of some of Mr. Moore's drawings in Adobe Acrobat® format (*.pdf). They are located here.